Perfect for Home-Made Sweet Chocolatey Treats! 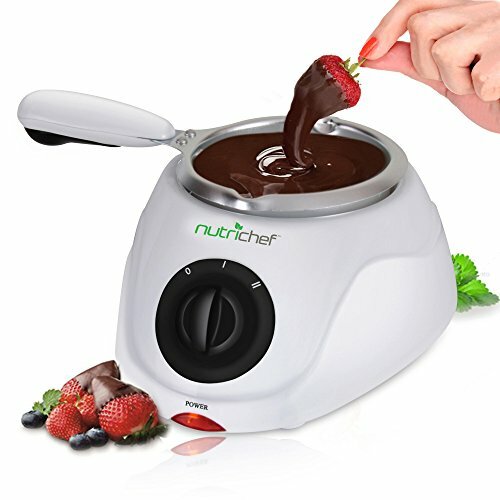 The NutriChef Electric Chocolate Melting and Warming Fondue Set - Perfect for Home-Made Sweet Chocolatey Treats! - Keep Melted Chocolate Warm in the Melting Pot - Add Gooey & Delicious Chocolate for Decorating - Make Cakes, Cookies, Biscuits, Wafers & Cupcakes - Simple Electronic Plug-in Operation - High-Powered Heating Element - Safe, Food-Grade Construction - Includes Fun Shaped Chocolate Casting Molds - Perfect for Fondue Parties, Chocolate Lovers and Chocolate Decorators - What’s in the Box: - Heating Hotplate - Melting pot - (6) Fun-Shaped Casting Molds - Accessory & Dipping Utensils - Draining rack - Technical Specifications: - Pot Capacity: 0.55 lbs.